Share what we see with our patients. 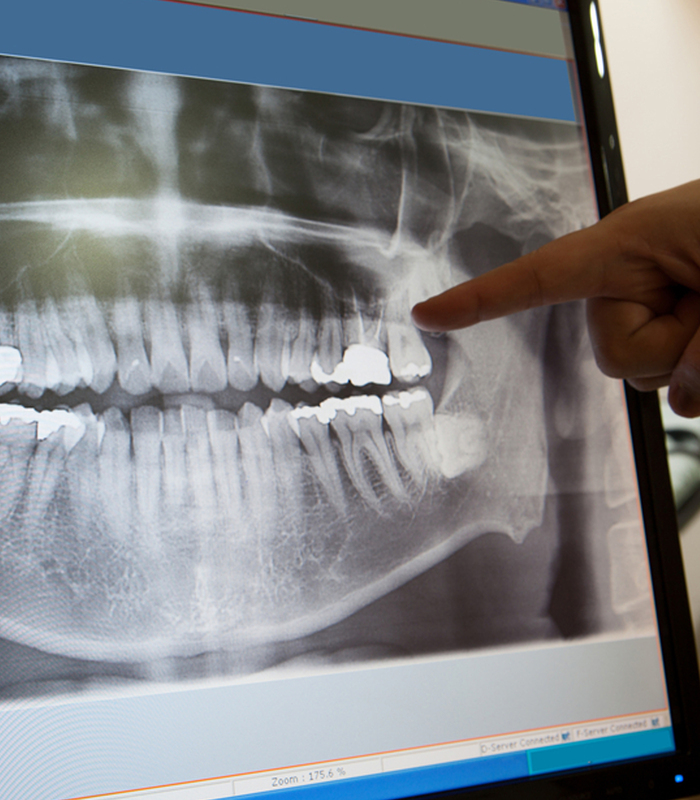 Exams and x-rays are a big advance in dental diagnostics. Using a special sensor instead of film, they allow the dentist to instantaneously capture an x-ray image of an intra-oral structure with greater accuracy than film images, while reducing radiation exposure to less than half of that needed for a traditional film x-ray. Also, digital x-ray images can be enlarged instantly, so we can share what we see with our patients. Exams and x-rays have always been an important part of dentistry and proper diagnosis of dental problems. Not all dental problems are visible to the dentist’s eyes alone. Without x-rays, it is often impossible to see what may be going on between the teeth, under old fillings or crowns, or under the gums and in the bone around your teeth. Additionally, pain or discomfort most often does not occur early on in the disease process in your mouth. Tooth decay and loss of supporting bone around your teeth can occur long before anything is felt by a patient. In fact, often, by the time a person feels discomfort or pain, the tooth or bone has been significantly damaged. Most frequently, patients are completely unaware of any problems before they are detected on regular x-rays. We also have brand new digital CBCT Pano X-ray machine which shares all the advantages of other digital x-rays, and allow us to extra-orally image your jaws, jaw joints, wisdom teeth, and other structures.